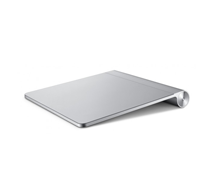 Apple Magic Trackpad at best price in india -- sits perfectly flush next to the Apple Wireless Keyboard and lets you use all the Multi-Touch gestures built into OS X Lion to control and interact with whatʼs on your screen.Swipe through photos. Scroll up and down web pages. And click anywhere.